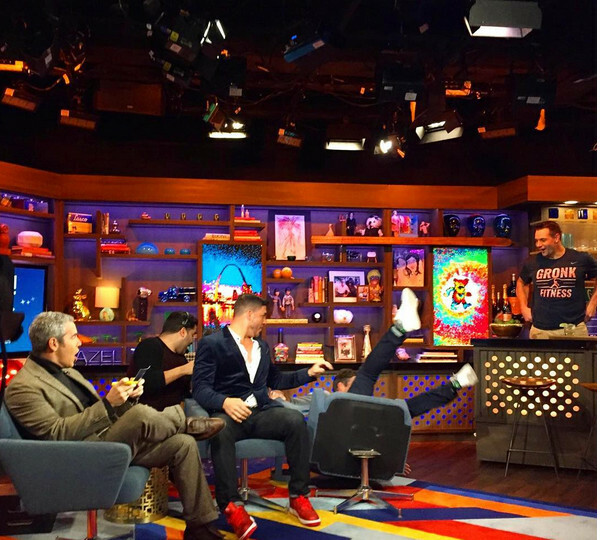 Tonight’s Watch What Happens Live guests are Bravo Superfan Jerry O’Connell and Vanderpump Rules star Jax Taylor. We kick off the night with Jerry breaking his clubhouse chair moments before they hit the air. And it pretty much sets the tone for the laughs and shenanigans that continue on through the show. Jerry O’Connell is doing press for a new project and during an interview this morning he was asked which Housewife was his favorite – a tricky question for him because he loves them all. He told them Dorinda Medley because she “made it nice!” and then Dorinda popped in during the interview to surprise him. Is Jax going to marry Brittany soon? Is there a wedding in the near future for them? “We’ve been dating for a year! So, as of today, no. In the future, possibly.” He tells Andy their age difference is about 10 years. It must be noted that Jerry does an amazing and hilarious James impression. Actually he was doing a few of them all night, including one of Brittany‘s mom. I recommend taking a look at tonight’s episode if you didn’t yet – there were a lot of fun moments that are best watched live. Jerry needs to be a co-guest from now on when there’s a Bravolebrity in the clubhouse. TELL US – HAS THE PUMP RULES CAST ‘GROWN’? WILL STASSI AND JAX EVER GET BACK TOGETHER? WILL TOM AND KATIE’S MARRIAGE LAST?